This year we had 50 EVs, 3 electric bicycles and an electric ZBoard. The Tesla Model 3 Performance was the newest star of the show. Mary from EMotorwerks showed off the Juice Box EVSE. The charging outlet that was installed previously got plenty of use as did the 2 temporary charging stations brought in for this event. 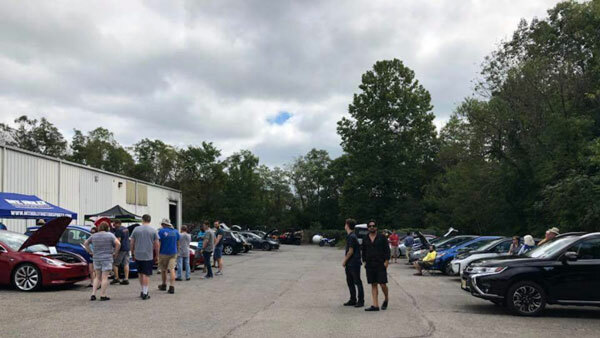 Mt Holly Motorsports made lunch for everyone and any money collected was donated to Susan G Komen of Central and South Jersey. We had great music from our new pa system all day with a few “electric” songs mixed in. We used our new prize wheel to allow everyone who signed in a chance to spin the wheel and win a prize. 14 different people got to take a test ride on an electric Zero Motorcycle. An electric bicycle rider rode all the way to our event from Philly 25 miles away and everyone had a great time. This years event was bigger than last year and we are already looking forward to 2019! Registered attendees report 876,650 electric miles driven.